Ananda has continued to develop its brands and its unique Urban Living Solutions, resulting in becoming the leading developer of residential projects in close proximity to mass transit stations in Bangkok. The company develops and sells various real estate projects in Thailand, ranging from low-budget to upper-scale properties. It operates through Real Estate Development, Management of Real Estate Development Project, Construction Service, and Other segments. It’s stylish, modern and high quality, yet affordable products have led to Ananda becoming one of the best-known property development brands in Bangkok. Real-estate companies that run online campaigns usually have two main objectives, which are either to build awareness about the project or get customer’s personal information, including their contact details and e-mail. We identify each of these potential customers who have expressed their interest by registering on the landing page of the project as “leads”. Over the years, fierce competition in the real-estate industry has pushed most of all the cost metrics in digital advertising sphere to be higher, mainly Cost Per Lead (CPL). Ananda has outlined to us in 2016 that their primary KPI is to ensure that by the end of 2016, the average CPL should not be higher than a specific number which means we have to ensure that the performance of the campaign throughout the year has to be carefully monitored and well-strategized. How does Ananda benefit from having a lower CPL? It is quite simple. Lower CPL means they can get more leads at a lower cost. If we can reduce cost in acquiring leads, it allows for more volume of leads with the same budget which in turn helps them achieve their secondary objective, getting maximum leads with the provided budget. Syndacast’s data-driven capabilities along with relevant audience targeting have been key factors in achieving the said CPL target. Ananda’s campaign usually relies on 3 main channels, namely, Google PPC ads, AdBoost and Facebook Lead Generation ads. Moreover, today’s customer journey requires 3 channels at least to convince a customer to register or make a purchase. On top of that, more customer journeys are happening on mobile than desktop, and we have to be right there to capture it. 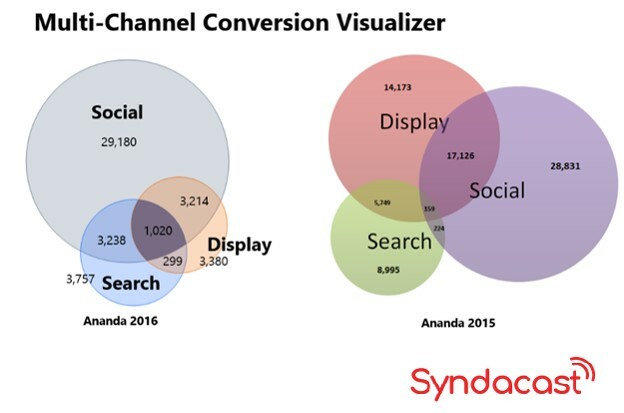 When Ananda approaches Syndacast to run campaigns, we weight the budget for each channel which will be utilized as aforementioned. This weight is not a guessing game; it is based on data of previous year, which we call “Multi-channel conversion Visualizer”. This visualizer helps us understand which channels are converting the most in terms of leads. Thus, this translates to a smarter media planning and execution of the campaign. • Reducing reliance on single site. • Prospecting: Creating lookalike audience, which gives us more opportunities to target similar customers who have registered or expressed interest. • Retargeting: Retargeting has been proven very cost-effective for Ananda’s campaigns especially flagship campaigns that are 2-3 Million Baht per Sales Order. • Optimization on keywords and ad text: Monitored daily to ensure that the keywords we are bidding on are performing and to avoid keywords that are high in CPC. We were able to achieve Ananda’s KPI and at the same time generate a great number of leads over the year. We were able to maintain targeted average CPL, 13% lower in terms of KPI. While YoY comparison between 2016 vs 2015, we were able to reduce the CPL by 26%, which is an impressive number considering that there is an oversupply and the industry’s competitive nature.